The plane trip from Santiago to Punta Arenas in Chile was one of the most scenic flights I’ve ever been on, with incredible plane window views. I was extremely lucky: the clear sunny weather made it possible to enjoy the stunning, uninterrupted views of the Andes mountains, lakes, volcanos and countless fjords. If you’re southbound, sit on the left side of the plane (i.e. row ‘A’. Row ‘F’ if you’re northbound). Taking off from Santiago. Andes mountains in the background. As the plane takes off from Santiago and there’s little smog, you’ll be treated to amazing views of the city and the towering Andes mountains in the background. You might even catch a glimpse of Mt. Aconcagua, South America’s highest peak. The plane basically traces the line of the Andes, keeping west of the Andes (or risk breaching Argentinian airspace) as it heads south. 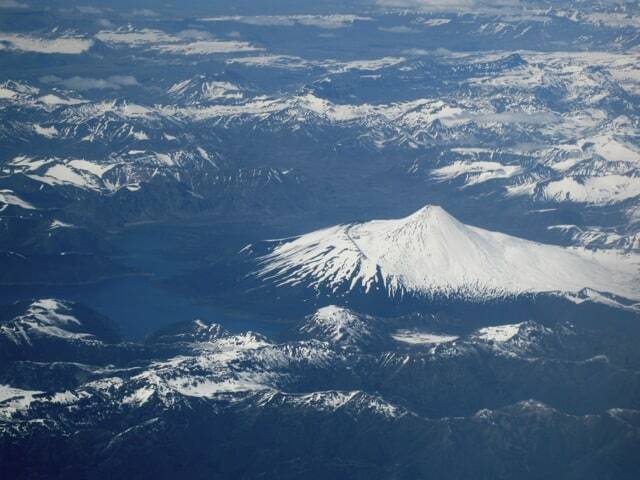 After about an hour, the magnificent lakes and volcanos of Chile’s famed Lake District come into view. You can’t miss the gorgeous symmetrical cone of Volcan Osorno at the edges of Lago (Lake) Llanquihue and Lago Todos Los Santos. These are the lakes you’re cross if you opt for the Andes lake crossing tour from Puerto Montt in Chile to Bariloche in Argentina. In the background, the majestic snow-capped peak of Monte Tronador is simply captivating. From this point, the magnificent fjords will grab your attention. Dotted with countless islands and lined by huge, snowy mountains, the fjords are truly breathtaking. This area is the beginning of Chilean Patagonia. The best is yet to come though! Heading further south, the plane flies over the awe-inspiring region of Patagonia. The scenery at this point is simply mind-blowing: immense lakes with massive glaciers flowing into them; impressive peaks; and huge chunks of icebergs floating in the lakes. The highlight is the Patagonian icefield. Many glaciers originate from it, including the famous Perito Moreno glacier, and flow into nearby lakes. 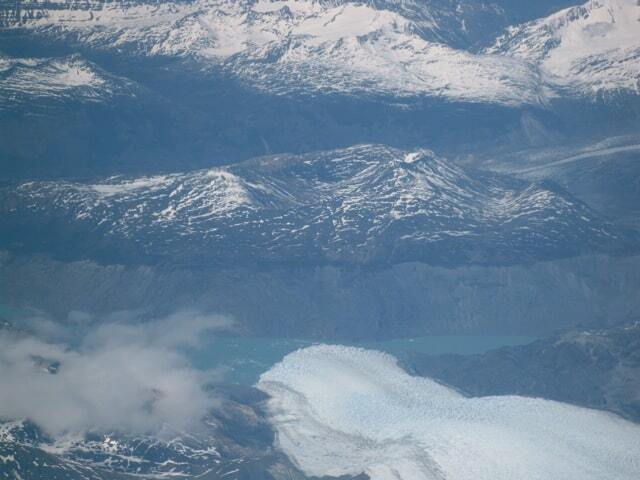 When you see two giant glacier lakes, Lago Viedma and Lago Argentino, with their glaciers and icebergs, you’ll know you’re flying above the twin national parks of Los Glaciares (in Argentina) and Bernardo O’ Higgins (in Chile). The sight of the rugged peaks of the Fitzroy mountains is absolutely breathtaking. Further south, you’ll be treated to more views of the amazing glaciers including Uppsala (it looks like a giant tongue that rolls down the mountains into a lake) and Perito Moreno (another easy-to-spot landmark: it flows down the mountains into an ‘L’-shaped lake, splitting the lake in two). Soon, the Torres del Paine National Park will come into view. With it’s craggy peaks and countless lakes, this national park may be a bit more difficult to spot as you might fly directly above it. If the weather is clear, this 3.5 hour flight will be one of your most memorable ever! See more Plane Views articles. I don’t think that info is available anywhere. In this example, it was a domestic flight from Santiago to Punta Arenas and since the Andes mountains form the border between Chile and Argentina and the plane was flying south, it made sense to sit on the left side of the plane. Thanks for this post, which I am finding useful all these years later as I choose seats on the same flight. In the comments you mention checking the approximate flight path before your flights. I was wondering how you do this – can you give me any tips? Is the information available online anywhere? Thanks so much for pointing out this error to me. Sit on the left side of the plane for southbound flights from Santiago. The left side = row A. Have a great flight and I hope the weather cooperates for you to enjoy the views. I’ll do the same trip / same flight this weekend from Santiago to punta arenas. I’ll then travel southbound. To book my seat you said to take a seat in the right side of the plane : row “A”. However the right side of the plane is row “F”. Could you clarify to me ?? Amazing pics of familiar places. Brought back some great memories of a long while back. I do that too! Always get a window seat to look out and snap photos whenever something interesting shows up, even cool cloud formations. These from Chile are gorgeous. A very interesting view is when flying the northern route from Europe to America: when passing Greenland, one can actually see the earth curve. Very cool (Sadly, I don’t have any photos of that). Thanks for your comment! That plane trip kept me captivated almost throughout the flight. Big ‘wow’ factor! It would actually make a cool list: the most spectacular commercial airline routes in the world. From the photos, it looks like this flight would be on the list. It’s truly amazing! You’re so lucky to have experienced this!